Yesterday, Our family enjoyed a trip to the Bronx Zoo. My office happens to be closed for St Patrick's Day, so it was the perfect day to enjoy with family. The weather was perfect, not too hot and not too cold. 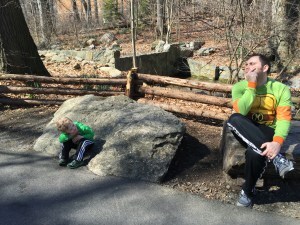 Based on this and our many other trips to the zoo, I thought I'd compile a list of tips to get the most out of your day at the zoo. Get a Membership: If possible, having a membership to the zoo is a wonderful thing to do. If you plan on going several times during the year, it is definitely worth the money. It also takes a lot of pressure off any individual visit. If you just spent a ton of money on admission, you want to see you money's worth of animals and activities. If on the other hand, you know you can come back as many times as you want at no additional cost, you can relax and really enjoy your visit. You also have the peace of mind knowing that if it rains or your child has an unprovoked meltdown, you can always come back. Pack a lunch and snacks: While zoo memberships generally provide a discount for food purchases, it can still be pretty expensive to eat there. Packing a lunch greatly reduces the cost of your trip. Additionally, you have your food with you wherever you are in the zoo. This means you can provide instant gratification when your child(ren) gets hungry. This can totally prevent a meltdown or a shortened trip. It is also important to have snacks and water. You will be doing a lot of walking around so having snacks and water available is important for both you and the kids. Let your kid(s) lead: You have had many years to explore the zoo and see the animals you want to see. Now, it's your kids turn. Other than preventing them from going into restricted areas, let your kids take the lead or tell you what animals they want to see. This trip after all is for them. They will be happier and will relish the opportunity to be in charge. Their happiness is your happiness, isn't it?! Encourage interaction with the exhibits: At just a few weeks past his 3rd birthday, my son is definitely not reading the signs associated with each exhibit. He is also not excited by sleeping animals. Try to help your kid interact with the exhibits. If the sea lion is "talking", see if your kid can make the same sound. Can he squawk like the birds? Can she make the face the gorilla is making? Can he stretch his neck like the giraffe? Can he spot the red bird? How about the green one? Especially for little ones, the exhibits are only as fun and exciting as you make them. So have fun. Start hopping like a kangaroo and practicing your lions roar! Arrive early and/or go on an off day: By arriving early, you can avoid a lot of hassles that come with outings to popular locations. You can hope to avoid at least some of the crowds. Your kid will have the most energy at the beginning of the day. You can avoid the constant questioning of, "When are we going to see the animals?" You can avoid lines at your favorite exhibit. Another good idea is to go on a random weekday. Our trip yesterday was perfect since schools were in session. We didn't have to worry about a lot of other kids running around and it allowed us to give T more freedom walking around. He also didn't have to fight for a spot to see the animals. I hope these tips are helpful for your next trip to the zoo. They really make our zoo trips a ton more enjoyable. Do you have any zoo advice? Leave it in the comments!